Below you will find some mores examples of the Absolute Office lectern range with logos. Note: Prices for organisational lecterns are Subject to Change without Notice. 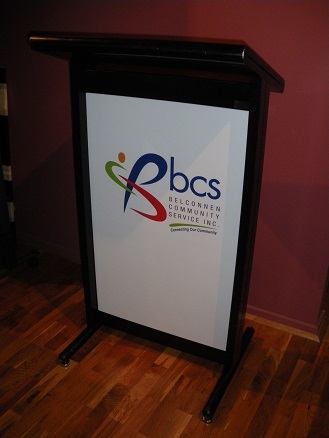 To make an inquiry regarding our Lecterns for Schools for rent / hire, please feel free to contact us either by telephone (on 0418 574 767 or in Victoria on (03) 8420 7788),email or by using our Inquiry/Booking Form. We will endeavour to respond to your email or Inquiry Form submission within 24 business hours.